On Thursday I posted about how I’m learning to master differences in vocabulary across the Atlantic divide. After living in the U.K. for two and a half years, I’m also slowly but surely coming to terms with what it’s like to live in a country with universal health care. For starters, doctors tend to medicate way less over here unless you’re really ill. They also do fewer preventive screenings for things like breast and prostate cancer. But one of the most surprising aspects of the British National Health System (NHS) is that it actually encourages patients to take more responsibility for monitoring their own health. I say “surprising” because one of the negative stereotypes of socialized medicine is that when you place health care in the hands of the government, you effectively create a nanny state, wherein the government – not the individual – makes decisions about personal health. But that’s actually not quite right. Precisely because the system is designed to worry – first and foremost – about the population, patients are actually encouraged to do a lot of basic health care on their own. So, for example, I’m rather fair and freckly by nature – and have a history of skin cancer in my immediate family. Back when I still lived in the United States, those two risk factors meant that I saw a dermatologist once a year to look for irregular moles and such. When I first moved to the U.K., I dutifully made an appointment to do the same thing over here. But the dermatologist I saw here actually discouraged me from coming in annually. Instead, she took some photos, gave me a diskette and told me to go home and continue to monitor my skin carefully. When, as, and if I found something suspicious, I should compare it to the photos and call them if things had changed. DIY skin care, if you will. Wow…what a radical idea. And I must admit that it felt a little strange. But you know what? By the third year, I canceled the appointment and took a look at those photos instead. And you know what? In an age of responsibility, I felt more grown up. Was anyone else as troubled as I was that the piano is on its way out as a staple of the American living room? I don’t even play the piano and I still felt nostalgic when I learned this! 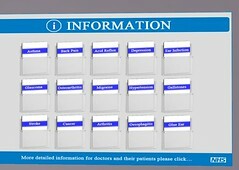 Image: Second Life: National Health Service (UK): by rosefirerising’s photo stream via Flickr under a Creative Commons License. I’ve had doctors who actively discouraged me from taking any responsibility for my own health. The UK system sounds much saner in that regard. I hadn’t realized the piano was a staple in living rooms. Hmm. Dear me – I shall the fair and freckly and family history factors and hadn’t realized I should be seeing a dermatologist OR monitoring my own skin! Clearly I would have benefited from more of this non-nannying approach!